Galley Wench Tales: Fireworks! Biggest Show in Florida. 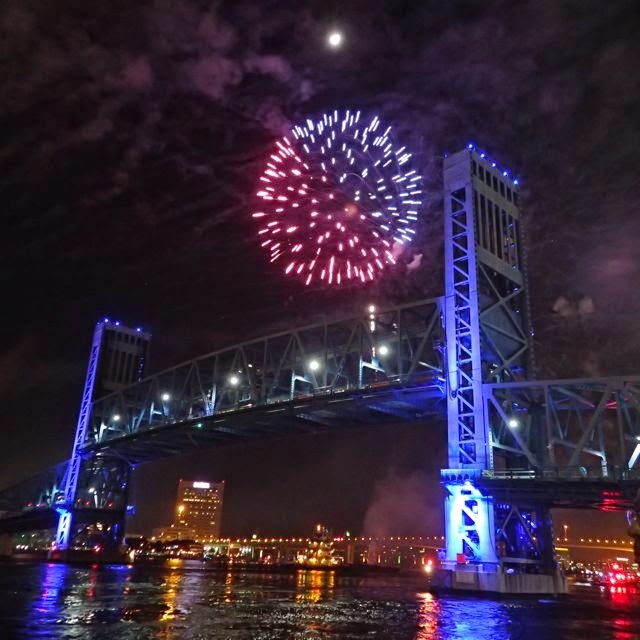 And the Jacksonville fireworks show takes off with a bang! 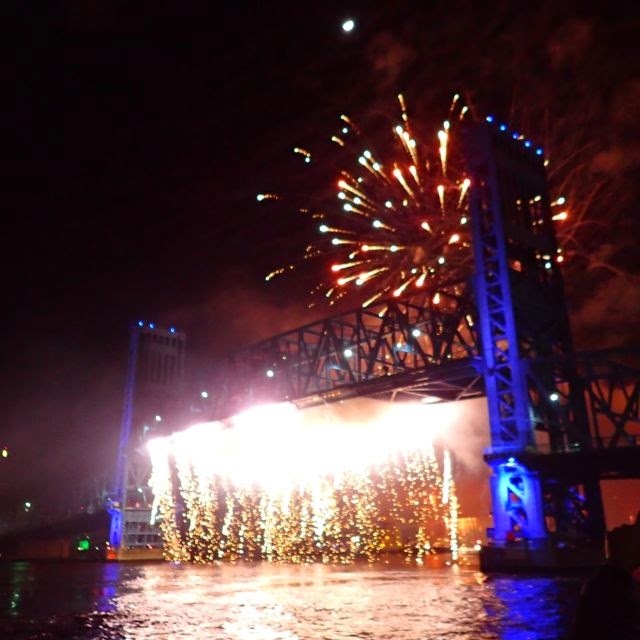 Normally austere Jacksonville puts on one heckuva fireworks show the Saturday after Thanksgiving, following their boat parade (watch for a future post on that). 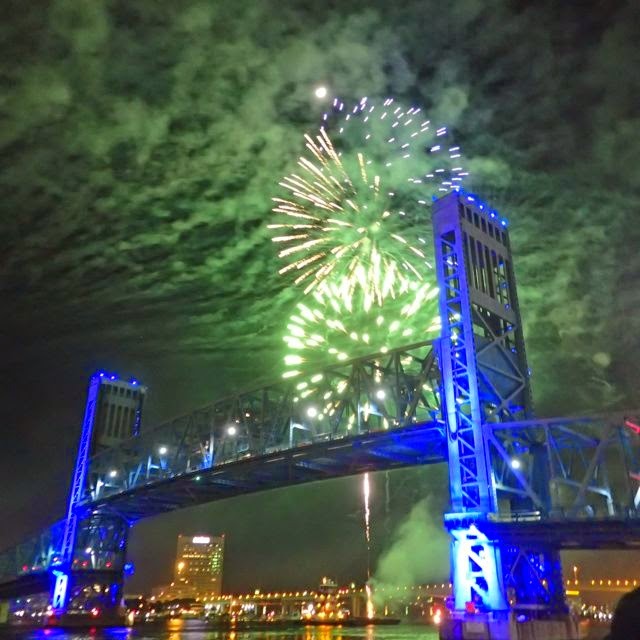 Rumor has it, it's Florida's largest fireworks display. Even though we've had our hands full trying to get ready for our two year South Pacific voyage, we still managed to take time out to smell the fireworks. Wayne, Ann (aka "Krazy Lady") and I got killer seats for the show as there are no bad seats. 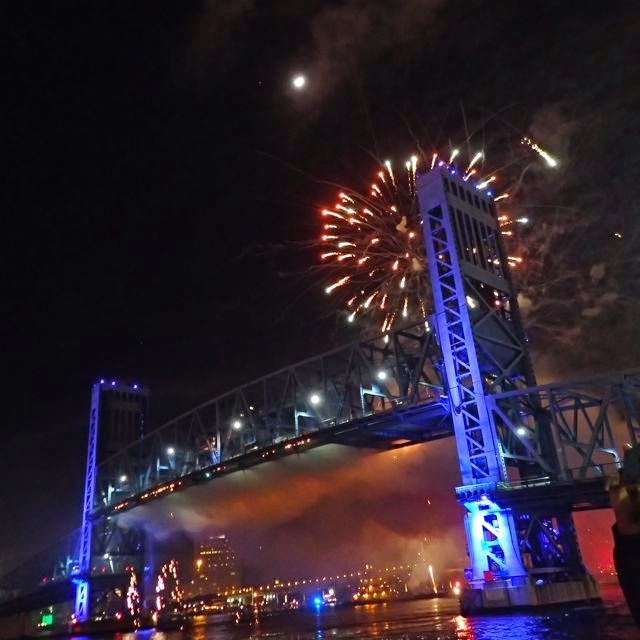 If you're in Jacksonville Florida the Saturday after Thanksgiving - don't miss Jacksonville's post-Thanksgiving fireworks (or the boat parade -coming up on a blog soon)! We made it out, sort of, today. We're hunkered down overnight at Sisters Creek (N30.23.877 W81.27.524) just outside Jacksonville FL and about 2 miles from the Atlantic. Yesterday we weren't ready to go carless until we finished that last of our get-ready errands. By then it was 5 pm on a river too tricky to navigate in the dark, so we took off this morn from NAS JAX headed toward the Atlantic (after selling our car last night - yippee!!!). If the weather genies are kind, tomorrow we'll spend the next 2 days sailing non-stop ~230 nautical miles to Stuart FL's Manatee Pocket. 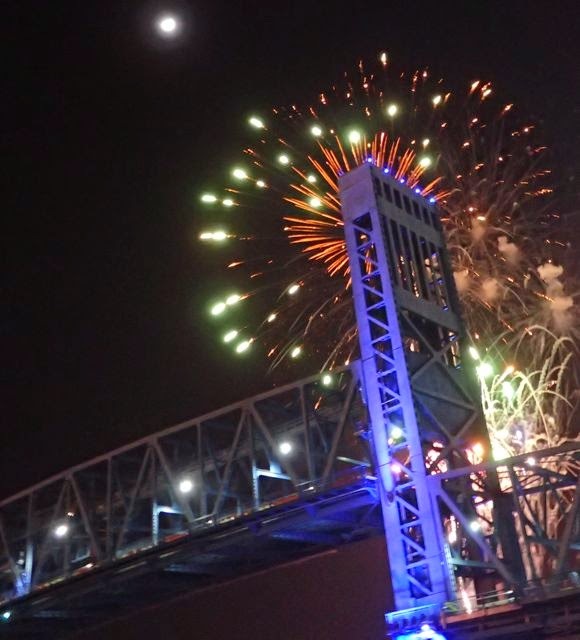 Nice of J'ville to give you such a nice send off! Ken (out of the hospital in a day. Not good news, not bad news. Just more of the same). Thanks, Ken. Wishing you more good news, no bad news. More of the same, hmmm, guess that's better than bad news. Take care -- a big heart like yours deserves the best. And thank you sooo much for the dive gear. It's all in good shape except one minor repair we hope to make in Key West (BCD doesn't inflate). A fellow cruiser who's a little smaller than Wayne was delighted with the wetsuit (which was too tight for Wayne). We've been crazy busy.... more soon!